One might argue that Takethecoupon is not a malicious program. Then what do you call an extension that can enter the operating system and install itself onto the installed browsers without permission? Malware researchers at pcthreat.com have revealed that the suspicious browser plugin does not have an official download page and always travels bundled with third party software. Whether you download the extension itself or choose to acquire some other program, you are likely to discover bundled installers if you choose the services of unreliable software distributors. Note that the suspicious plugin may hide behind fictitious Adobe Flash and Java updates as well. All in all, Takethecoupon removal is crucial, and you should handle it as soon as possible. Takethecoupon may be installed as TAkeTheCOuoPon or TakETThheCouapon on your browsers. This is a trick that schemers use to circumvent the removal; however, if you are vigilant, you should have no trouble realizing that this is a suspicious application and that you cannot trust it. As malware researchers have discovered, the program has been created on the JustPlug.It extension engine and it is distributed using the InstalleRex-WebPick installer. This is not a surprising combination because other unreliable advertisement supported programs, including MinimumPrice and Happy2Save, which can modify their own names and which we recommend having deleted are represented in the same manner. Even though these applications may appear to be different, there is no doubt that they have been created for the same purpose – to promote suspicious third-party services. Takethecoupon is set to promote these via intrusive pop-up and banner ads which are likely to flood the browsers when surfing the web. Unfortunately, these ads could lead to the installation of personal data tracking cookies, could initiate redirecting to corrupted sites and could promote malware installers. Due to this, you should delete Takethecoupon right away. Do you want to avoid intrusive virtual data tracking processes? Do you want to eliminate the risk of being presented with fictitious deals and offers? Then you need to delete Takethecoupon from the operating system immediately. The program is used for the benefit of third party advertisers and possibly cyber criminals, which is why you should not allow it run on the system for another moment. Even though some computer users may remove Takethecoupon manually, we advise that you trust automatic malware removal software to do this job. This software will eliminate all existing threats and, more importantly, it will ensure that the operating system is shielded against other threats. Now click the unwanted application and select Remove. Now select the Control Panel and click Uninstall a program. 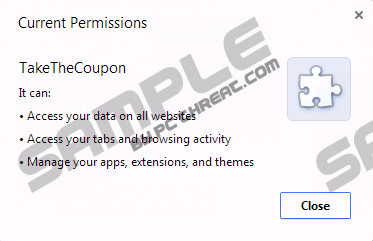 Quick & tested solution for Takethecoupon removal.